I went to Rosario, Argentina, the first week of January for a magazine assignment, and the group I was with ended up having lunch on the bank of the Rio Paraná, a big muddy river capable of handling large cargo ships for carrying grain and coal. Like so much else about this land of the Pampas, the Paraná reminded me of something you’d find in the Midwestern United States–specifically, it was perhaps wider than the Missouri River but not quite up standard set by the Mighty Mississippi. 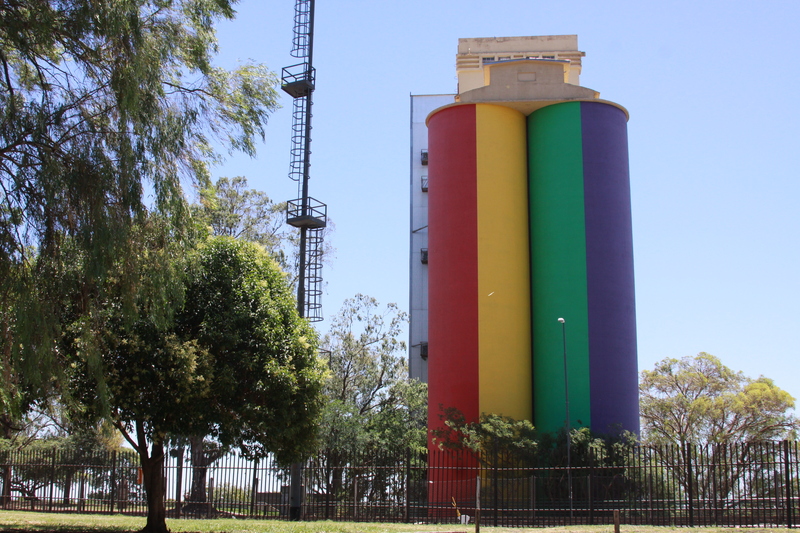 As we had earlier driven into this large city–Argentina’s third-largest, with nearly 1.3 million people–I noted a couple of grain elevators, including what looked like a huge wooden one. But I was being herded with a group of reporters following the Dakar, a marathon rally for motorcycles, cars, and trucks. Rosario sprawls over 70 square miles, so there was no way I’d be able to make my way back there from the hotel where we were staying near the river. How surprised was I when we went from the Juan Manuel Fangio Autodrómo, where the Dakar teams were set up before the rally’s start, to have lunch? 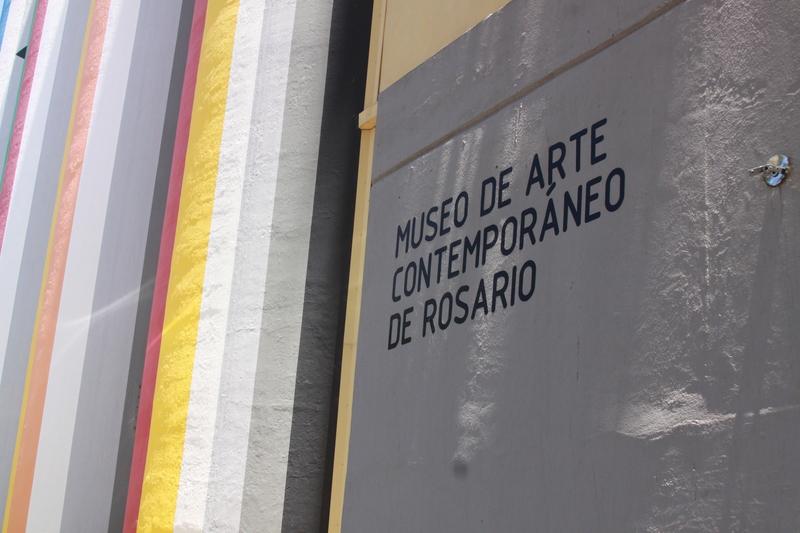 The destination was a restaurant affiliated with the Museo de Arte Contemporáneo de Rosario–the museum of contemporary art. 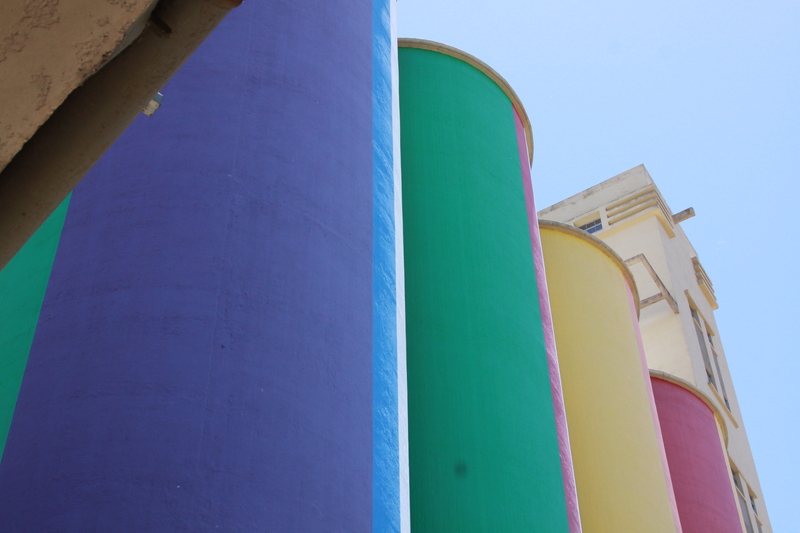 We parked on the riverside boulevard, Avenida Estanislao López, and as soon as we started walking I saw the colorful bins of a made-over elevator. The art museum is integrated into the elevator! I didn’t come away with any specifics, although it did occur to me to look for manhole covers that might have been cast with the builder’s name. I saw none, though. As for the rest I hope these pictures tell the story. By the way, Argentinians are very proud of their beef, and I was told repeatedly in advance of the trip that I should be sure to eat the beef because it’s out of this world. I did have a couple of nice steaks, but there’s no difference from U.S. beef. 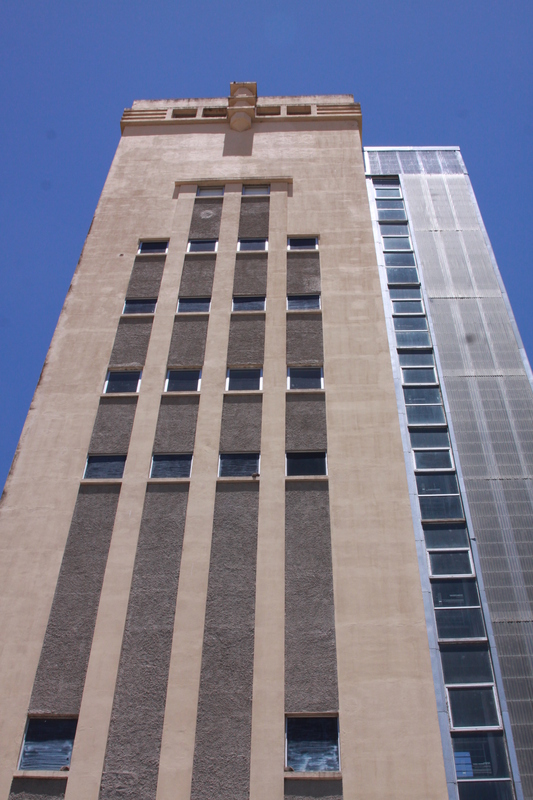 This tower, attached to the elevator, faces out to the river. And this footnote: the passenger next to me on the flight home said the countryside has changed since the Chinese market for soy opened up–fewer grassy pastures, more fields with the crop. Presumably, there would also be changes in the way cattle are finished for market. Anyway, that explains why so much of Argentina looked like western Kansas, minus the farmhouses and barns. 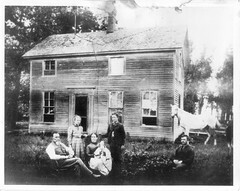 The countryside is curiously devoid of buildings; everybody lives in town. This entry was posted in Miscellany, Other Companies, Photography and tagged architecture, construction, grain elevator, museum, Rosario Argentina, slip-formed concrete. Thanks for a colorful story! I’ve recently completed a 45 minute slide presentation on the history of elevators and have been fascinated with the creative reuse that is occurring all over the world. Here are a few that your readers might want to google: a 5 star hotel in Venice, http://www.molinostuckyhilton.com/‎; a climbing gym in Oklahoma City, http://www.rocktowngym.com and a fully operating steam run elevator museum in Atlanta IL, http://www.haweselevator.org/. Let me know if you have need for a presentation!